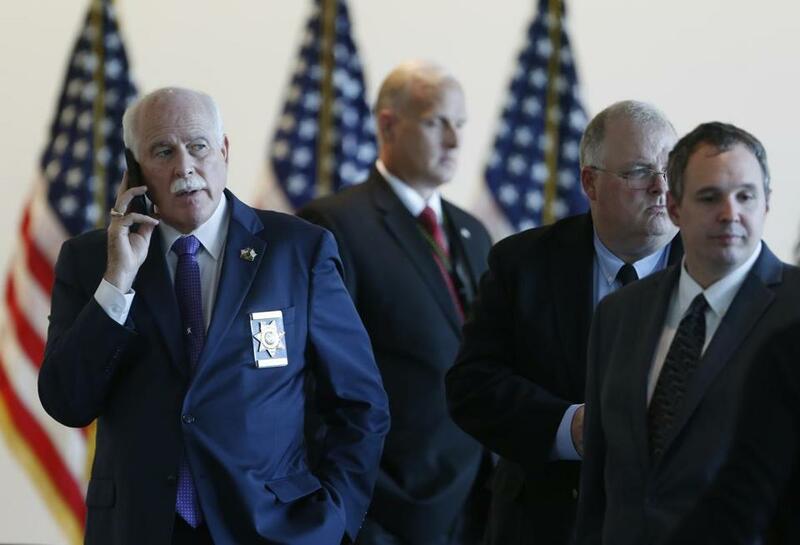 Bristol County Sheriff Thomas M. Hodgson (left, on a cell phone) and Securus Technologies Inc. have been sued for their contract to provide phone service to county jails in Massachusetts. The lawsuit alleges that the contract represented an illegal kickback scheme that has nearly doubled the cost of calls made from country jails. For the 95-year-old mother of one inmate, the high costs of taking phone calls from the Bristol County House of Correction forced her to choose between paying medical bills and talking to her son. Relatives of a 49-year-old inmate awaiting trial at the North Dartmouth jail didn’t bother to set up a phone account because they couldn’t afford it. The teenage daughter of another inmate, Michael T. Ray, had to rush through conversations with her father so the call didn’t get too expensive. Pearson is among four plaintiffs, two of them inmates, who have sued Bristol County Sheriff Thomas M. Hodgson and Securus Technologies Inc., a Texas-based company that provides phone services for inmates across the country, over the high phone rates. The lawsuit alleges that the sheriff office’s contract with Securus represented an illegal kickback scheme that has nearly doubled the cost of calls made from county jails. The lawsuit, which was filed Wednesday by lawyers representing prisoners and consumer rights, alleges that between August 2011 and June 2013, Securus paid Hodgson’s office $1.7 million in exchange for an exclusive contract to provide phone services to inmates. It paid the sheriff’s office a lump sum of $820,000 to cover 2016 to 2020. The company offsets the high cost of the contract by overcharging friends, lawyers, and families of inmates who must set up accounts with Securus to get calls from their loved ones, according to the lawsuit. “The excessive costs that are imposed on families by these payments are unlawful attempts to exploit vulnerable Massachusetts prisoners by commercializing their contact with the outside world,” said Brian Highsmith, an attorney with the National Consumer Law Center, which joined Prisoners’ Legal Services and The Legal Services Center of Harvard Law School in filing the complaint. The lawsuit is the first in Massachusetts to challenge such contracts, according to the plaintiffs. Securus Technologies provides phone and video calling services for jails in 10 of the state’s 14 counties, as well as the Massachusetts Department of Correction, which operates the state's prisons. “We’re hoping this [case] establishes a principle that these kinds of kickbacks should be illegal everywhere,” said Bonnie Tenneriello, a staff attorney with Prisoners’ Legal Services. In Bristol, each time an inmate places a call, Securus charges $3.16 for the first minute and 16 cents for each additional minute, Highsmith said. That means a 10-minute phone call will cost $4.76. Inmates have also complained that calls are often disconnected, meaning another $3.16 charge is applied when they call back. By comparison, a call from a prison run by the state Department of Correction costs 10 cents a minute with no fee for the first minute, Tenneriello said. That disparity shows the arbitrary nature of these contracts, she said. “What consumers are being charged has no relationship to the actual cost of providing phone service,” Tenneriello said. The lawsuit, filed in Suffolk Superior Court, seeks compensation for the inmates’ loved ones and lawyers who incurred the costs. Hodgson described the lawsuit as “frivolous” and said the fees paid by Securus help maintain the phone system and pay for programs and counseling. Without those fees, the county would be forced to call on the Legislature to provide more funding, he said. “If you’re coming here to prison because you can’t follow the rules of your community and you victimize the people who are, why should those costs be transferred to the taxpayer?” Hodgson said. Securus representatives did not return phone messages. In a 2016 interview with the International Business Times, Securus CEO Rick Smith said his company provides a vital service to law enforcement, who are able to listen to recordings of inmate conversations for potentially incriminating statements about a crime or threats against witnesses. He said rates are driven up by the large fees, known as commissions, that sheriffs and correctional facilities demand in exchange for exclusive contracts. The FCC did not prohibit commissions but set new rate caps nationally in 2016. Those were challenged by Securus and a court order stayed the new rates. Lawyers in the Massachusetts case said Hodgson and the company are violating consumer protection laws. They likened the phone rates to the $5 daily charges Hodgson once levied on inmates for room and board, a fee that the Supreme Judicial Court ruled in 2010 the sheriff had no authority to impose. Hodgson rejected the comparison and said the contract with Securus was approved by the state through the Office of the Comptroller. He denied that the phone system keeps inmates apart from their families or attorneys, who are free to visit them in jail. But prisoner advocates say phone calls are often the only source of direct communication for families who live far away or have disabilities that make it difficult to travel. Pearson, for example, was in a car accident in 2015 that left her in metal crutches, which jail officials said she was not allowed to bring into the jail. Between September 2015 and June 2017, Pearson, a mental health clinician, estimates that she spent $2,000 on phone calls with Ray, a once-promising football player who became addicted to opioid pills and heroin after an injury. He began stealing to pay for his addiction, Pearson said. In June 2017, he was in county jail awaiting trial for his most recent arrest for armed robbery and was stressed about the case and his inability to care for his family. It was not unusual for him to call four times a day. But Pearson, overwhelmed with bills, pleaded with him to call less frequently during their last phone conversation on June 10, 2017. Ray hanged himself in his cell the next day. The lawsuit does not blame the phone system for Ray’s suicide, but Pearson said the challenges of communicating with his family deepened his despair.